Following on from her debut album, Seasons of Love in 2012, this album is full of cheeky exuberance and nostalgia, plundering the back catalogue of the 1980s for a quirky selection of numbers to be given a jazz makeover, all of which are served up in a fresh and sophisticated new guise by Yorkshire vocalist Beverley Beirne and her quartet. Produced by veteran Jason Miles, who has worked with Marcus Miller, Luther Vandross and even the great Miles Davis, we have here elegantly mixed yet instantly recognisable tracks such as Adam Ant’s Prince Charming and Kim Carnes' Bette Davis Eyes, where you can see the appeal to a jazz arranger in taking it on. Others are more surprising choices, slowed down and treated to a reworking of harmony and sometimes a tweaking of the lyrics to render them into a new idiom, like Noddy Holder’s Feel The Noize or Foreigner’s I’ve Been Waiting For A Man (sic) Like You. The Specials’ Ghost Town is artfully done as a swing number but lacks its zeitgeist grit as a record of Thatcher’s Britain. The fastest and most transformed number is a bebop version of Kajagoogoo’s Too Shy with its breathtakingly frantic cymbal tick, while Hot In The City Tonight whose honkytonk groove has a pleasing hint of the theme tune from Grange Hill. Beverley’s co-conspirator, pianist Sam Watts, has created settings for her vocals which leave space for the textures and colours in her voice to really shine through, giving the album a truthful connection to all these former pop songs, allowing the band getting behind the lush, synthetic versions to something more stripped down and acoustic. Rob Hughes on tenor sax adds a thread of continuity, simultaneously harking back to all those '80s sax breaks while providing something much more out there by way of jazz solos. Each song is subtly transformed so that it’s no longer trying to be the crowd pleaser that it was in its pop format, but while the production values are stripped away, what is preserved from the genre and the era is its infectious unrelenting sense of fun. Flo Moore on bass and Ben Brown on drums create a fabulously fat sound, and Beirne’s vocal riffs and scatting are properly integrated into the mechanics of each song rather than floating on top of it. The graphics and photography for the album pay homage to that brash, highly saturated, pre-digital aesthetic reminiscent of '80s album covers, but the album’s overall identity is less in-your-face. Some of the instrumentation and soloing is really inspired – a Hammond organ for instance on Deeply Dippy gives it a new twist, although the song itself is quite slight as a vehicle. The most satisfying track on the album is ABC’s When Smoky Sings, whose treatment here as a wistful ballad is particularly classy, bringing an emotional tone to the song that wasn’t there in the first place. Pop Musik is the album’s calling card – and its call to action – the lyrics reinvented as "everybody talking about…. jaaazzzz", in which Beirne showcases her vocal skills, trading phrases with the band members with a wonderful light-hearted energy. 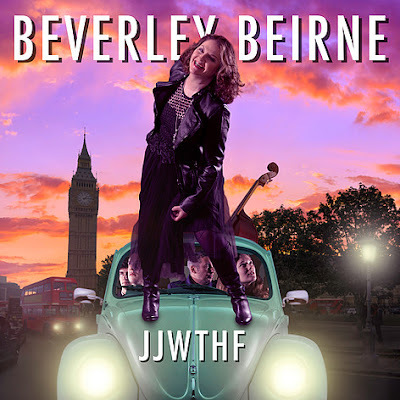 Beverley and her band will be at Ilkley Jazz Festival (of which she is artistic director) on 18 August.